College is awesome, isn't it? Yes, it can be one of the most stressful times of your life, but there are so many things about it that are fun! I went to a community college for two years while living at home in Minneapolis, then transferred to a Bible college in Chicago. The school pretty much required students to live on campus, so I was in a dorm room for three years with four awesome roommates (all at different times). The dorm rooms were tiny, with two small closets, lots of regulation furniture and about 2 inches of floor space. Decorating each year required some creativity! Looking back, I am shocked to remember how poor I was a college student (my roommate & I once turned down an event because it cost $2.00. Two dollars.) 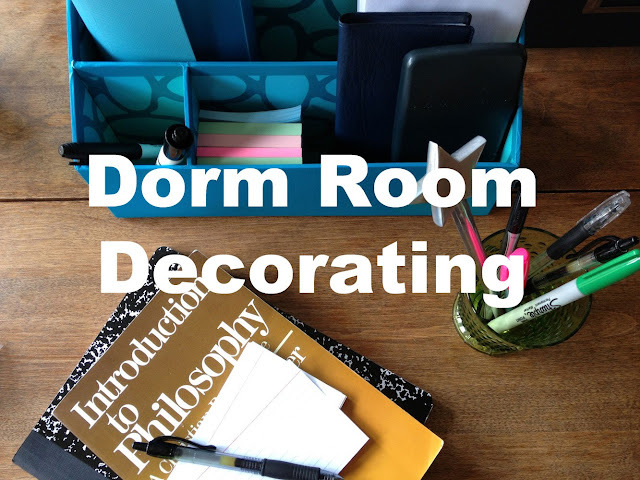 So I wanted to pull together a few things that are helpful for decorating your dorm room (or other small space) on a college student budget. If your dorm room is like mine was, there are about a thousand rules for what you can't do: no nails, candles, paint, fun... So you have to get around those rules with some creativity. *We couldn't put nails in the wall, so we painted 3M hooks (which are made to not leave a mark when you take them off the wall), stapled two looped pieces of ribbon to the back of a $5 Target mirror, & hung it sideways. Voila! Something on our wall & bonus: it made the tiny room look bigger. *My desk chair was one a friend had found in the Home Depot dumpster, which I covered with brown & pink fabric using safety pins. *We covered the back of our door with 3x5 cards where we wrote down funny quotes (or at least they seemed funny after an all-night study session). You'll be surprised what you can come up with when you think outside the box a bit to decorate your dorm room! Come back on Mondays in July & August for ideas on how to store your stuff, make the room cozy, & use things like paper & 3M hooks to give your room some style.